The case is from the early days. The "Reborn" plate didn't last too long. As long as we don't know if there is a linear relation between serial number and time of production (evidence does not point in that direction), anything could have happened in 1980. If you use serial number in a linear way then in 1980 Reborn's were produced op to early may, Reborn Old from early may to june and Love Rock from july to december. 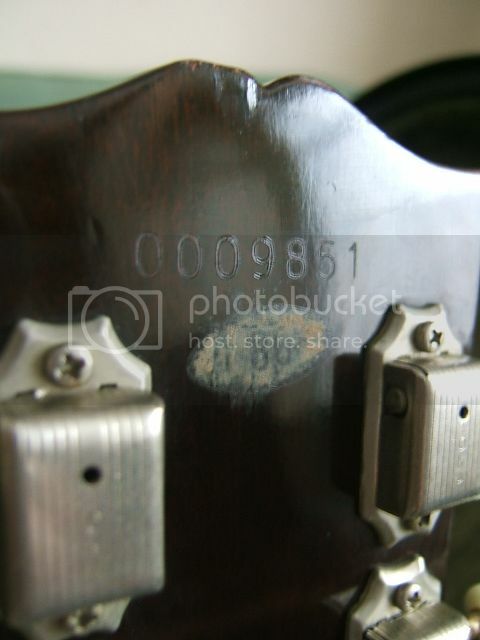 This guitar would then be from early july, only 2 months after the end of the Reborn era. I did say september 1980 earlier for evidence points in another direction, how I did come to that conclusion is too much to explain for now. We don't know if this is the case the guitar left the factory in. We don't know how the case and the guitar got to Carrboro, North Carolina. 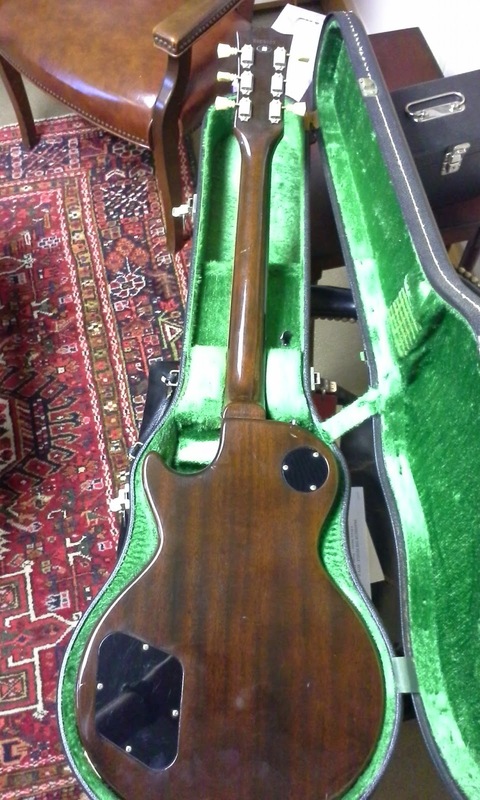 It is possible the guitar and the case were purchased separately and later mated. Either before or after leaving Japan. These guitars (and cases) are very rare in the U.S. So I guess the guitar and case came to the U.S. By mail. It could be somebody ordered them separately from Japan. As a 45 year old guitar obsessive who visits every guitar store in town regularly wherever I live ... And that is D.C., NYC and NC over the past 35 years of playing.... 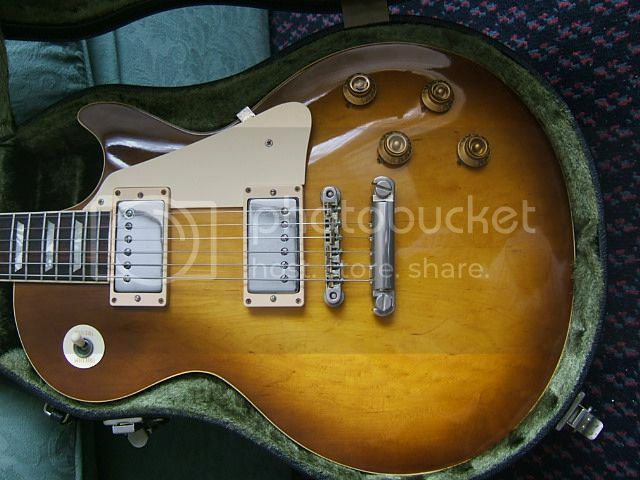 I have never seen a Tokai like this for sale in a store. Indeed, this is the first truly gorgeous "lawsuit" guitar I have ever seen in the u.s. First one of this "Historic" quality. 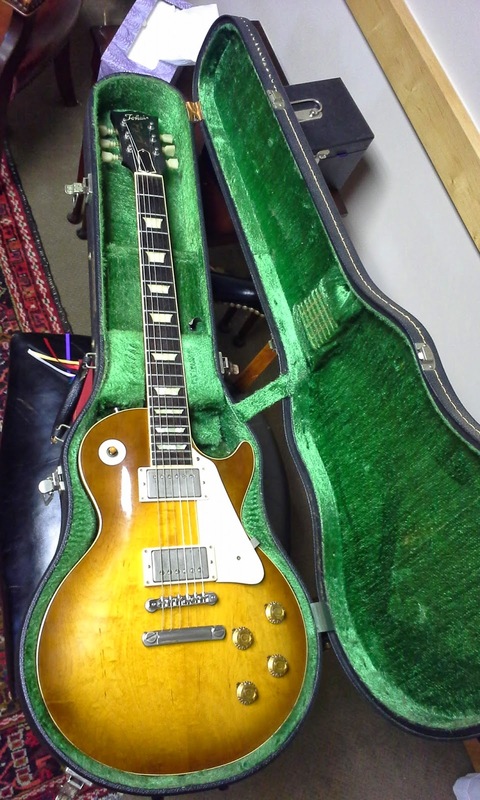 That said I believe the case left the factory with this guitar back in 1980. It is not too strange to imagine they had more of the Les Paul Reborn cases in inventory and mated them to early Reborns and Love Rocks. 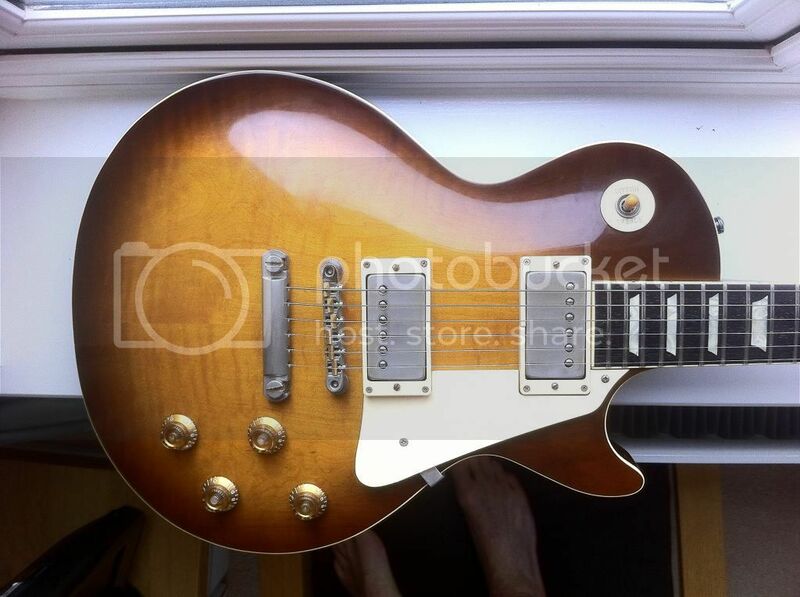 and one thing that I can't quite fathom is whether these guitars are BS or OS (brown sunburst - old sunburst) ? The case I have with mine is the normal green/black with the Tokai "star" plate, and I guess it came with the guitar originally. Marcus (Mojo Hobo, who I recently bought the guitar from on here) tells me it came from a well-known Japanese studio musician who presumably had it from new. It has had upgraded pots and Black Cat caps and what looks like original SD 59's with the black tape. Anyway, it plays and sounds well, with very little playwear for a 34 year old ! Well I'll be damned. A Mancusian doppleganger! 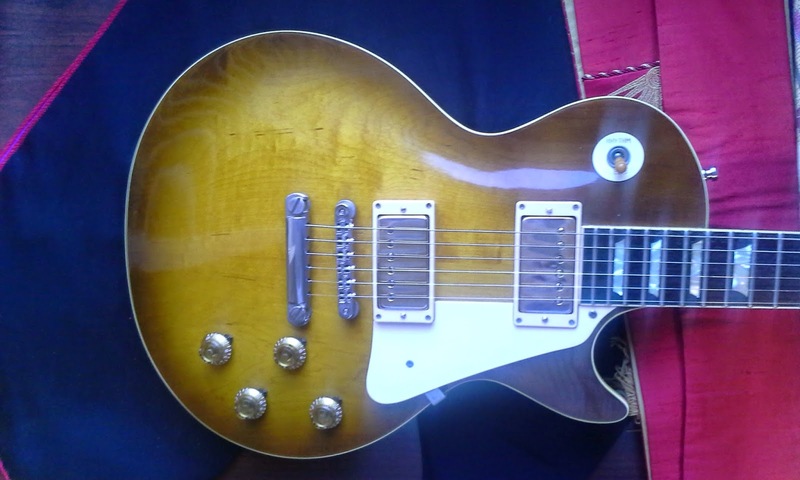 WOW ... taking all Gibson vintage and custom shop examples into consideration, this must be the nicest Les Paul I have seen in a long time!!! Congratulations! So I added these Duncan Antiquities -- they sound fantastic. Gorgeous. I spent a week in Bath last June and a week in London. I wish I knew there were so many sweet Tokais around. I've been looking for one of these for a long time. I finally got one, and I'm thrilled beyond words. So I have joined the registry. 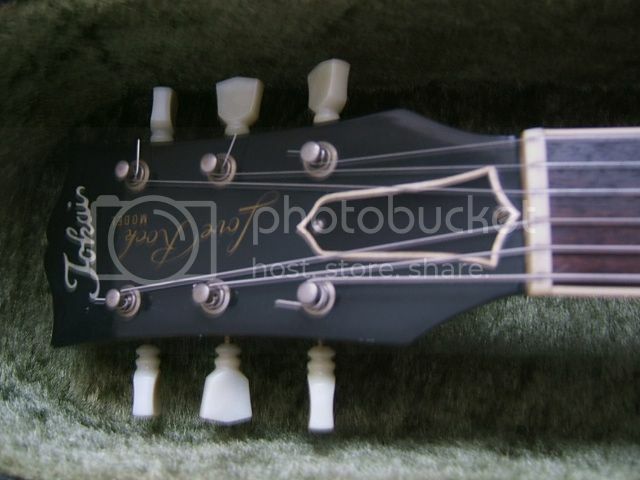 It's an interesting piece in that it has double ring tuners, a model number sticker ('80') on the back, impressed serial number 0009909, and the case says Les Paul Reborn on it. I haven't pulled the pickups to see what they are. They sound like very nice low output vintagey type PAFs. cool ... I just pulled the trigger on one almost exactly like yours. '80 LS80. The only difference is that it has open coil pickups but I will change that soon. Thinking about selling it. Offers? 1,600. How come the sale, not enjoying it or getting neglected? I am offering it up mainly for the money. Plus I'm compulsive and like to get new stuff and I have my eye on something. A fine reason indeed and a great deal you are offering.